In a message to its members Tuesday, the National Reverse Mortgage Lenders Association’s co-chairs reiterated the trade group’s support of the latest changes to the Home Equity Conversion Mortgage appraisal process — a shift designed to stop losses to the Mutual Mortgage Insurance fund. Written by leaders Joseph DeMarkey, the strategic business development leader of Reverse Mortgage Funding, and Reza Jahangiri, the CEO of American Advisors Group, the message expressed NRMLA’s “faith” in the Federal Housing Administration’s decision. The FHA issued Mortgagee Letter 2018-06, effective October 1, which stated that all HECM appraisals will be be subject to verification under the FHA’s proprietary collateral risk assessment. If the first appraisal appears to be inflated, a second appraisal will be ordered and the lesser of the two must be used. The process is expected to be fully automated by December 1, and will employ automated valuation models (AVMs). Speaking to reporters last week, Montgomery said that last October’s principal limit changes were not enough to stop the losses to the MMI Fund, and that the appraisal change was the best of many solutions considered. The new policy was enacted after FHA reviewed 134,000 HECM appraisals with an AVM program, revealing that about 37% of appraisals were at least 3% over-valued. Some of the loans reviewed were from 2008 to 2010 — a period when appraisals were estimated to be 30% too high or more. “Prior to this announcement, the NRMLA Board had submitted other proposals to address the fund’s potential shortfall. But, given the fact that the FHA Commissioner seat had remained vacant until June of this year, the staff was under great pressure to act expeditiously,” the message said. 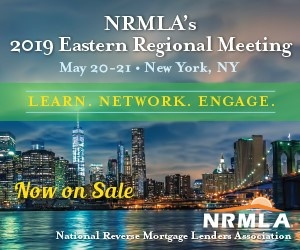 The NRMLA message also acknowledged some of the industry’s concerns about the new process, which include the potential for overly lengthy appraisal timelines and the unreliability of AVMs. “While there are some concerns being expressed within the industry about this appraisal process, especially with regards to the impact to consumers, for now, we believe what is best for the industry and the program is for all of us to work within the new appraisal process structure, observe its impact, and continue to share our findings with the FHA staff,” DeMarkey and Jahangiri wrote. Montgomery said the process will be reviewed periodically over the next year, and NRMLA is dedicated to being part of the process. When FHA first made the announcement, NRMLA released a statement of support.